Do you want to promote you project? 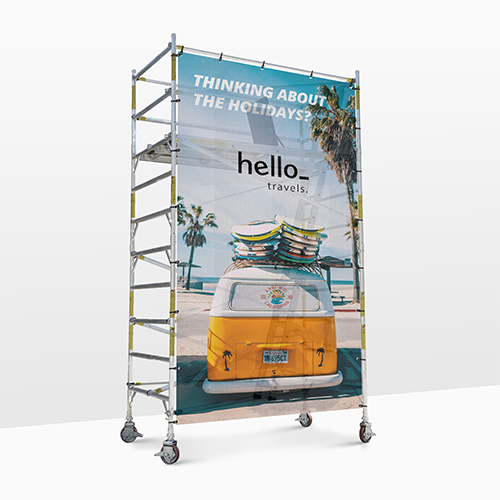 With the scaffolding banners from Helloprint you will stand out on the streets. 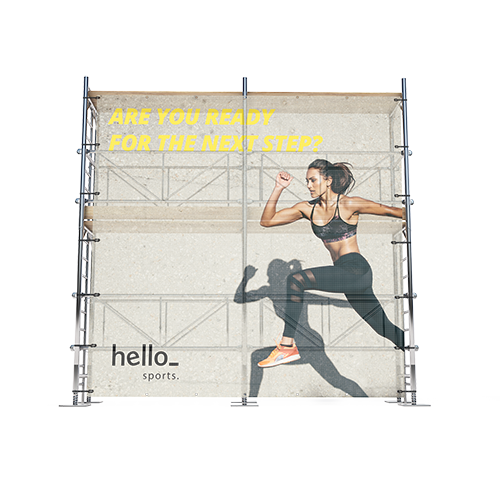 You can order the scaffolding banners in almost any size you would like to order, as long as it's within 7 square metres. Keep 50 mm safety margin. Simply upload and proof your artwork directly after payment. No design available? No worries! You\'ll upload and proof your artwork directly after payment. Please fill in the preferred dimension in centimeters. 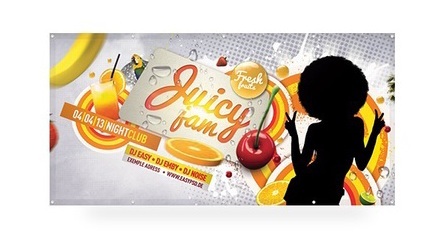 We can print and produce banners up to 7 square metres. Do you want a banner without rings? Choose a trimmed banner. Do you not need rings every 30cm, but still want a suspension? 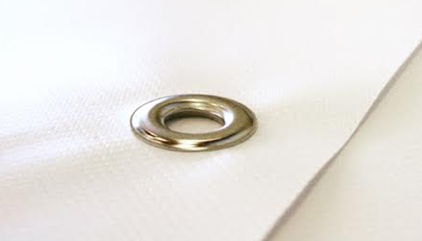 Choose rings in the corners without hems. This option is suitable for the smaller banners (smaller than 150 x 300 cm) and is the cheapest option for hanging up your banners with rings. Do you want a good suspension? Choose rings every 30 cm. This option This option is suitable for the smaller banners (smaller than 200 x 200 cm) and is a cheap option for hanging up your banners with rings. Hems are recommended for banner larger than 4 m2. 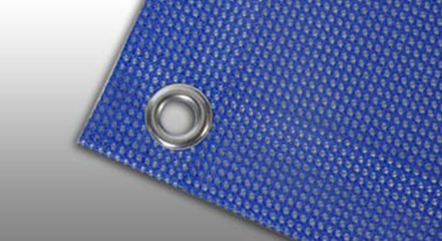 Choose to have your banner with hems and rings every 30cm for the strongest suspension and most secure display method. If you don’t want to have rings every 30cm but still want to hang your banner securely then choose to have rings in the corner, with hems. 4 How many prints would you like? 5 Do you need elastic bands for suspension? Do you already have elastic bands or are you not planning to use elastic bands to display your banner? 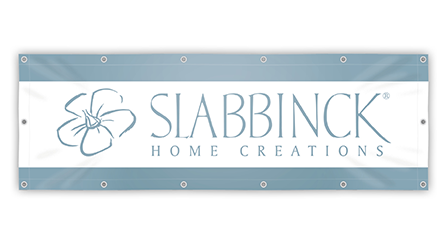 Simply order your banner without bands! 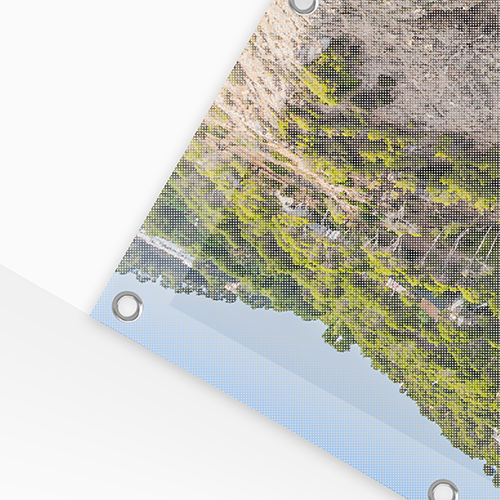 Keep all important text and images at least 50 mm away from the edge of the finished size. 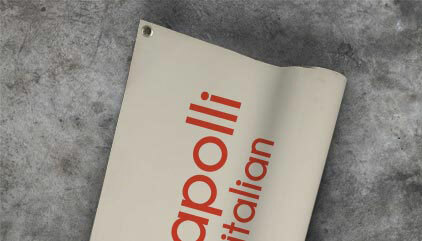 Banners are one of our most-sold products and are very popular as a promotional display print. It can be printed with the design of your choice. You can promote yourself or your business if you place the banner where it can be seen by a lot of people! For the delivery of your scaffolding banners we use multiple carriers. Because of the highest reliability, in most cases we use UPS or DPD. 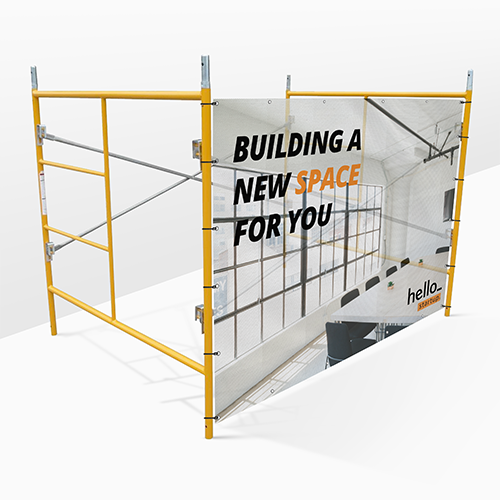 The scaffolding banners that is chosen in most cases can be selected via our website. Budget banner (450 gsm PVC sailcloth): This banner is of lower quality. It is for one-time-only use and is used a lot on (themed) parties. 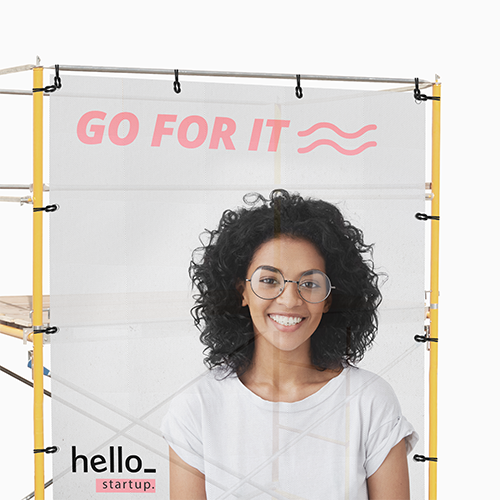 Wind Proof: MESH Canvas. 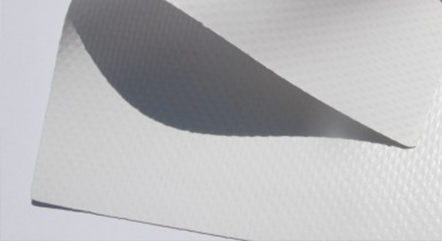 NOTE: Due to the material/texture of Mesh Canvas, the edges can have a slightly different appearance when the canvas is folded over and sewn with the rings in place. Blockout (Both sides): Blockout Banners are slightly thicker and unlike other banners, not transparent. Perfect for printing on both sides! 3mm Foamex board (Indoor): Light weight, made out of two synthetic plates with a hard foam core (Foamex). These sings are used a lot indoors for wallcovering and displays. Maximum surface 2m2 per panel. How are Scaffolding banners finished? Trimmed, without rings: The banners will be only be trimmed. This results in not being able to hang your banner up. Rings in the corner, without hems: With this finishing your banner is trimmed and has rings to hang it up (Note: only possible to hang up banners with a maximum size of 150 x 300cm). The distance from the edge of the banner to the rings is about 15mm. Rings every 30 cm, without hems: WIth this finishing your banner is trimmed and has rings to hang it up (Note: only possible to hang up banners with a maximum size of 150 x 300cm). More rings result in more possibilities to hang it up! Rings in the corner, with hems: Finishing your banner and adding hems and rings in the corner gives it extra stability and possibilities to hang it up. Ring every 30 cm, with hems: You are choosing to trim the cloth, to hem the cloth and to place rings every 30 cm with this option. The hems and the rings will make sure that your cloth will hang extra strudily. This is the strongest finishing option. Can I also buy elastic bands for my banner? It is also possible to buy elastic bands with your banner. If you have rings in your banner, elastic bands are very useful to hang it up steadily!